During Sharpsville’s role in a national aircraft tracking project of the 1950s, that object in the sky wasn’t a “strange visitor from another planet,” but it could have been an enemy plane. That was the thinking behind the Civil Defense Agency’s project, the Ground Observer Corps (GOC), which in its own way faced the same struggle as Superman’s: “a never-ending battle for truth, justice and the American way”. …there was a time that high-schoolers were hired as crossing guards. There were a lot of trains switching tracks and other activity when the steel mill was in full swing. The crossing guards had a little shack they hung out in until needed. Volunteers manned the post and, when aircraft flew by, the volunteers would call a central location and report the type of aircraft, direction, etc. I was a member of the civil defense as well as most of my friends, In fact, I still have my membership card. During the Cold War that followed World War II, a nuclear attack, possibly from Soviet Russia, continued to be a perceived threat. According to Wikipedia, the Ground Observer Corps was established in early 1950 to provide an aircraft tracking network. Over 200,000 civilian volunteers used binoculars and the naked eye to search the skies and identify any airplanes that happened by. “Filter centers” received telephoned voice information from 8,000 posts, and the information was relayed to Air Defense Command ground control interception centers. I remember working up there and calling in planes to the Brookfield air base. I even got my brother to join. It was while I liked one of the M_____ twins and they sometimes hung out there, too. It was boring if no one else was there, but we convinced ourselves we were doing something to prevent an attack of some sort. 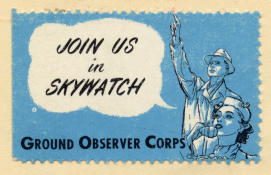 By 1952 the program was expanded in Operation Skywatch with over 750,000 volunteers at over 16 thousand posts and 75 centers. The program ended in 1959 when more accurate and cost-efficient automated radar networks went into effect. However, this did not end the memories of those who played a part in a national as well as local event of historical importance. More information about the Ground Observer Corp can be found here, part of a site that is maintained by the Air Defense Radar Veterans’ Association. The 1950s Ground Observation project in Sharpsville had an even earlier history. From 1941 to 1944, volunteers in the same aircraft observation post watched for German bombers during World War II. Read about this, see a photo of the rooftop post, and learn much more about Sharpsville during WWII in “The Home Front” in the November 2018 issue of the Sharpsville Area Historical Society Newsletter. and Irene Caldwell O’Neill (SHS 1960).